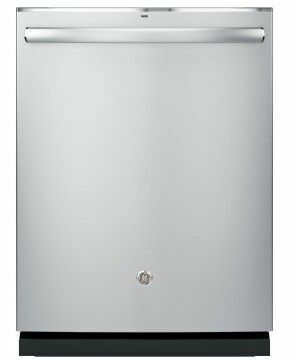 This durable dishwasher features a stainless steel interior to ensure stellar performance for years to come. 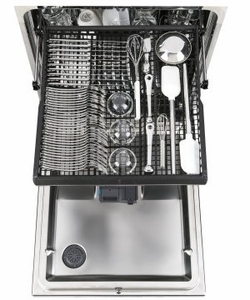 The spacious bottom rack features folding tines for multiple options in staging bulking pots or long cooking sheets. The upper rack is height-adjustable for extra versatility, and the convenient third rack is perfect for a collection of silverware, utensils, or smaller cooking dishes like ramekins. Dedicated bottle jets are designed to get to hard-to-reach areas in baby bottles or long stemware. Various cleaning options include a temperature boost, and an NSF-certified Sanitizing option. 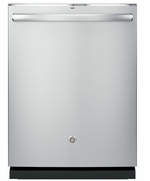 Other certifications include a CEE Tier I rating, and an ENERGY STAR rating for extra savings on energy consumption and utility costs. 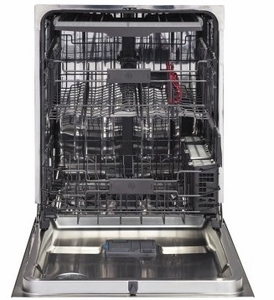 Clean hard-to-reach areas inside tall items with dedicated jets integrated into the upper rack that shower water deep inside for the ultimate clean. Quickly adjust the upper rack 2 inches up or down to accommodate tall glassware and 10.5" plates with plenty of room in the bottom rack for large platters and cookie sheets. 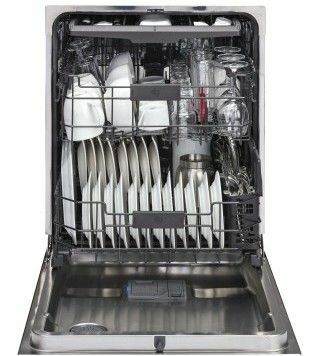 To ensure consistently clean items, this stainless steel blade rotates at 3,600 RPM to pulverize food particles, and it helps prevent large particles from clogging the wash arms. Height : 33 3/8" - 34 5/8"